10/22-26 ~ Pumpkin Moon? Hunter's Moon? Note: For those living in San Francisco this New Moon takes place overhead 16 minutes before high noon. The Sun, New Moon and planets are located in the same constellations for other parts of the world; these constellations, in differing time zones, lie in a different location above or below the horizon. The new lunar cycle begins in the constellation of Virgo the Virgin, our celestial chalice. The emanations of Virgo nurture our innate divinity, spiritual awareness and Christ consciousness until it can be made manifest, ultimately giving rise to the HU-man *, the God-man, the Christed ONE. The Sun, Moon, Saturn and Mercury are all found in Virgo the Virgin as this lunar cycle begins. Review map above. Each of these celestial bodies is creating a pathway for the manifestation of divine energies. The Sun in Virgo bestows the forms that demonstrate a consciousness having a greater sense of the whole. The Moon, when located in the Virgin, awakens within us a great potential toward world service. Mercury anywhere in Virgo allows the Divine idea to take root and gain strength, until it is born into the world. Saturn positioned anywhere in Virgo the Virgin conceives the structures that exteriorize the unfolding Christ consciousness. The Sun and Moon, Virgo's stars Porrima and Vindemiatrix, as well as the planets Saturn and Mercury line-up longitudinally. Review map above. Porrima, named after the goddess of childbirth and prophecy, emphasizes new beginnings and the use of guiding intuition during change and its birthing process. Vindemiatrix the Harvester is about exact timing and fruition. Mercury the messenger of the gods allows both stars to function in their highest expression. Saturn supports the exact timing of Vindemiatrix as the winds of change blow through our lives. Saturn is known for its quality of right timing, which inhibits, delays, restricts, perfects and deepens. The Sun, Moon, Porrima, Vindemiatrix, Saturn and Mercury lie above Corvus the Raven, the messenger bird. Review map above. Corvus communicates through all of nature, and asks us to read the natural world, to listen to and observe the signs expressed in daily life from the world around us. Arcturus and Spica, also in alignment with Corvus (see map above), assure us of our essential divinity and its everyday guiding voice. Spica symbolizing the sacred womb of the Virgin, accepts and nourishes the seed of divine will from Arcturus, the savior avatar. Helpful Star Map This seed of divinity resides in Virgo and therefore within humanity. Virgo the Virgin is awake and powerfully enlivened, stirring humanity's essential divinity from its slumber. The Higher Power within each and every one of us is being aroused. This new lunar cycle is stimulating pathways for divine energies to be made manifest on Earth. The essence of this zodiakal area, comprised by all of these conjoining entities expresses through the higher mental capacities associated with the ability to for-sense future probabilities, which includes clairvoyant and telepathic awareness. This prophetic ability is with specific purpose, not only for communication, but action. This is much more than receiving simple impulses of premonition, but is about how our attentiveness "extends" or reaches from the present into the future. This implies the ability to sense future unfoldment. The purpose of such eves-dropping into the future provides advantage in how to use our will in the present. The purpose of such future-seeing is so that we can prepare and create NOW what is needed "to meet" the future events to come. The events seen are already precipitating from the realm of probabilities, which we then meet in the unfoldment of our spacetiming. The winds of change are blowing. Right timing is essential for a harvest, a birth, a rebirth. Our essential divinity with it's divine vision helps us see and tune to the signs all around us, so that we may align with divine will and prepare for the future. We are the sacred Chalice for the Divine Host on Earth. Ponder Divine Prompting. This is the 2nd Full Moon during Libra (9/22-10/23). Draco the Dragon does indeed have a fiery breath. Perhaps you'll see it October 8-10! Legendary Draconid meteors – boom or bust in 2010? Zubenelgenubi is the southern "missing claw" of Scorpius. It has the dual character of making love or slaying its prey. The potential of stimulating revenge or repairing a relationship is present. Venus and Mars positioned near this star accentuate the duality. Young Luna reminds us the winds of change are blowing; follow divine promptings and right timing. Can you put out any fires of revenge? Who can you forgive? The view of the sky appears to move west 15°/hour *. Note: The sky appears lighter at 7:00pm. Brilliant Venus and dim Mars may be impossible to see in the twilight so close to the horizon. Venus sets near 7:00pm and Mars around 7:45pm. The sunset planets are sinking away. Generate times for your area. Look to the east to see Jupiter's bright beacon of light. Click the Sky Chart below to see Jupiter and a whole sky view. Click here to learn more about Vega and the Summer Triangle, the Keystone (wedge) of Hercules and the Big Dipper of Ursa Major, whose handle arcs to Arcturus, as shown in the map above. BTW: Have you seen the fiery breath of Draco the Dragon yet? Legendary Draconid meteors – boom or bust in 2010? Can you find Draco in the map above? Overcoming obstacles to the new incoming awareness begins with the waxing Crescent Moon. What was conceived at the New Moon, Winds of Change, Right Timing, Divine Vision, (review above) is now in the process of waxing or gestating. October 10-11, Sunday-Monday, waxing Crescent Luna leads us into the burning ground of Scorpius. Sunday look for the cosmic Scorpion's fiery red heart to the left of Luna and Monday to the lower right. Compare this 10/11 Map/Text with the map above. In the Scorpion's burning ground the evolutionary winds of change have us spiral dancing with death and new life. Scorpius presents us with tests and trials, while Antares demands we take a stand for the Truth. It is the Truth that sets us free to rise up like the Phoenix from the ashes. October 12-13, Tuesday-Wednesday, Luna introduces us to Sagittarius the Archer. Tuesday Luna lies above his arrow's tip and Wednesday above the vane. Telescopic Pluto is positioned above the top of the teapot asterism of Sagittarius. Review this constellation image and the map above. Use your imagination to mark the location point in our sky of the New Horizons Pluto-bound spacecraft – between Pluto and the top of the Archer's teapot. New Horizons was launched January 2006 and is scheduled to reach Pluto July 2015. This cosmic Archer with Pluto on his bow takes aim, zeroes in on the Light and Whole Truth and knows the way to go. His emanations illumine the useful intellect, allowing intuitive perception to see a new type of goal, one that unifies the dualities into a Divine ONE. The Archer teaches us to aim the arrow of the mind toward the intuition for divine vision and right timing. Call on Sagittarius when change is at hand. Will You See Her in the Day Sky? Luna swims and grows in the dark pool of the heavens filled with watery constellations and dim stars. Some call this the Celestial Sea. Capricornus the Sea Goat meets Luna with a big smile October 14-16 and is in good company with Neptune the sea god. Aquarius the Water Bearer and Piscis Austrinus the Southern Fish welcome Luna and her growing light in their deep waters October 17-18. Pisces the Fishes and Cetus the Whale [aka the Monster] along with unpredictable Uranus and beneficent Jupiter trick and treat Luna October 19-21! You may want to try sailing the Celestial Sea on a dark moonless night to test your navigation skills. Note: Jupiter can be seen in the east at nightfall and sets in the west around 5:00am. Jupiter anywhere in the vicinity of Luna is a celestial delight. BTW: Mira, a variable star in the constellation Cetus, changes in brightness during the year, making it visible or invisible to the unaided eye. Mira, reaching maximum visibility in early October, can now be viewed without an optical aid. Look for this variable star east (left) of Jupiter 11:00pm to dawn, when there is no moonlight interference. Will You See Luna in the Day Sky? Luna is large enough and rises early enough to be easily seen in the southeastern day sky around 4:00pm, October 14-16 and around 6:00pm October 17-19. In the evening get out those binoculars for the best view of Luna and her terminator, the shadow line dividing the lunar day from lunar night. It is here that sunrise occurs on a waxing Moon. Lunar craters, mountains and valleys are accentuated along this line of contrasting light. The Summer Triangle, sinking in the west, gives way to autumn's Great Square of Pegasus rising toward the zenith. Some see these stars as part of an Autumn Dipper, and a Flying Horse. Nearby moonlight will veil these stars; look October 14-15 or on a moonless night. One can draw a diagonal line from brilliant Jupiter toward the southwestern horizon to Fomalhaut, the Southern Royal Star. Click here to learn about Vega and the Milky Way, which sweeps through the Summer Triangle, to identify the Keystone (wedge) of Hercules, to navigate with the Big Dipper of Ursa Major, whose bowl point to Polaris our North Star and whose handle arcs to Arcturus at nightfall. Arcturus low in the west in the early evening (not shown in map above) and Capella low in the east around 10:00pm see map above are flashing colors now! The First Quarter Moon, exact Thursday, October 14, at 2:27pm PDT (21:27 UT) squares the Sun at a 90-degree angle and brings up a tension between desires and emotions, as we struggle for fulfillment. Ideally any obstacles impeding the awareness conceived at the New Moon are overcome at this time. First Quarter Luna conjoins Altair the southern point of the Summer Triangle. Review map above. This star is also the head or eye of Aquila the Eagle. Altair reminds us that vision and freedom come when the intellect can make the leap to intuition and we awaken to the promptings of our essential divinity. In flight Aquila is known to carry mighty thunderbolts in his talons. These can shake one to their core, if one fails to hear or resists the divine promptings. The waxing Gibbous Moon is more than half lit, moving toward its full sunlit phase. Illumination and growth are offered by this lunar phase, only if the obstacles from the past are cleared away. This must happen, if the energy released with the coming Full Moon is to be utilized. 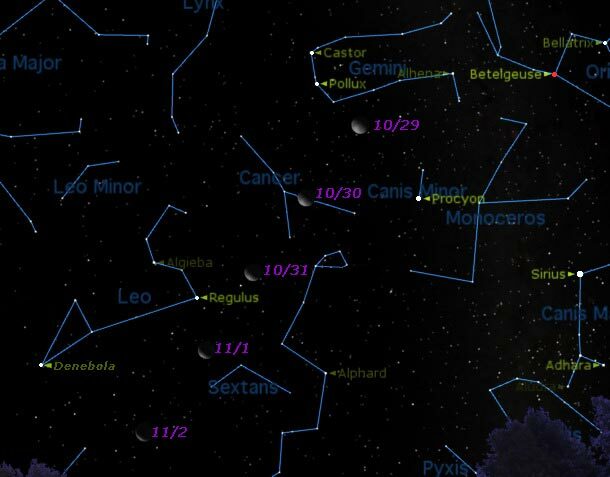 October 15-16, Friday-Saturday, "smiling" Capricornus and Neptune the sea god welcome Luna. Review map above. The emanations of Capricornus support a new cycle of effort, one with immense spiritual possibilities, one that gives full expression to the earthly nature. Capricornus can open the doorway to the head center and bestow humanity with divine vision and purpose. Telescopic Neptune in this constellation helps us when the winds of change blow, by aiding the creation or rebuilding of structures that manifest our dreams, our spirit on Earth. October 17-18, Sunday-Monday, Luna enters the depths of Aquarius the Water Bearer whose water jug provides nourishment for the Southern Fish and Royal Star, Fomalhaut. Review map above. Ponder these Aquarian keywords of the soul: "Water of life am I, poured forth for a thirsty world." October 19-21, Tuesday-Thursday, Luna swims with the two fishes of Pisces and the whale Cetus, also known as the Sea Monster! Unpredictable Uranus and wise, benificent Jupiter are lurking in these waters. Watch out for the tricks and savor the treats! Review map above. The fusion or union of the Pisces fishes, matter and spirit, produces the Incarnated Christ, the perfected individual soul. In this process the lesser and greater polar opposites — the human being and God — are brought to their destined, radiantly divine expression. This is truly a treat that can be savored, the HU-man * world savior. Rebellious Uranus in Pisces arouses a willful rejection of a limited reality and humanity must suddenly shift into new visions that encompass the greater whole and lead to greater freedom. Expect surprises and sudden opportunities, as well as the feelings to express youthfulness and freedom. This is very tricky business! Thanks to the pairing of Uranus and Jupiter, what initially appears as an unwanted trick could turn out to be quite a treat! The Chilean rescue of 33 miners and their rewards come to mind. Cetus is quite a trickster, even more so with the hide and seek variable star Mira. Is Cetus a whale or a monster? Is the whale's tail the monster's jaws or is the monster's tail the whale's head? Cetus Image The whale is an ancient symbol for creation; many myths speak of how human life sprang from the sea. On the other hand Cetus the Sea Monster represents destruction. Hmmm ... Cetus represents the human struggle, that of a spiritual being in human form. Creation, destruction, evolution ... It's tricky! The winds of change are blowing. Tune to the signs and omens all around. Follow divine promptings; they lead to right timing, ease and efficiency. October 22, Friday, Luna is Full! More below! Note: Jupiter lies to the right of the October 22/23 Full Moon. See this map/text. You just may see a pumpkin colored Full Moon rising in the east as the sky darkens Friday night, October 22, or setting in the west before dawn's early light Saturday morning, October 23. ‘Tis the season for a heavenly jack-o’-lantern to be smiling down upon you! Traditionally the Full Moon following the Harvest Moon is called the Hunter’s Full Moon. The origin of the name actually relates to the harvest. Since I’m not a hunter and love pumpkins and animals, I prefer calling this Moon the Pumpkin Moon. Hmmm ... Let's surprise our little animal friends by doing something nice for them during the Full Moon! A random act of kindness lifts all of our spirits. in the Libra II Clarity of Purpose Meditation. What was conceived at the New Moon, Winds of Change, Right Timing, Divine Vision, review above now comes to fruition and is birthed into the full light of our conscious minds. The Full Moon aligns with Hamal the butting head star of Aries the Ram. The jaws of the sea monster, Cetus, lie below and Triangulum, the Holy Trinity lies above. Review map above. Aries, the Light of Life Itself, represents the birthplace of Divine ideas. Aries streams forth the will or power of Deity, made manifest through the creative process. The butting head of Aries presents challenges with authority figures, arrogance and greed, which continually drop us into the jaws of Cetus, where the initiatory fires burn. The 2nd Full Moon during Libra is illuminated by the Sun positioned in the constellation Libra near Mercury. Libra is the point of balance in the zodiac, where spirit and matter maintain a poised equilibrium. Libra demands we walk the razor edged path of balance, the path of the soul and the awakened intuitive mind. Mercury illumines the mind so that we may link the personality to the soul. When the winds of change are blowing us off balance, we are reminded that Divine ideas are streaming forth from the power of Deity. Though we may be temporarily blinded by fear, greed and arrogance and challenged by earthly authority, our essential divinity with it's divine vision can help us see and tune to the guiding signs all around us. Aiming the arrow of the mind toward the intuition in meditation, reflection and stillness aligns us with divine will and prepares us, all in right timing, for the future. This 2nd Full Moon in Libra illuminated by the Sun positioned in Libra is emphasizing the need for balance between spirit and matter, between the personality and the soul. There is a call for balance, for "sanity", for unity beyond duality. We are being urged to choose the way between the two great lines of force, the Libran Way. It is good to remember we the people of this planet are evolving. In time we will learn to listen, trust and act everyday on our unifying guidance. This is a good day to ponder How the Still Small Voice Works. October 23, Saturday, at 5:35am PDT (12:35 UT), 11 hours after the exact Full Moon, Luna exactly conjoins Hamal the butting head of Aries the Ram and the Sun enters the sign of Scorpio (10/23-11/22). Scorpio helps us attune to the three lights of: form, soul and life, which meet, blend and rise. It is the burning ground of the rising Phoenix. What challenges are you butting your head against? What must die within you so that new life can come forth? BTW: In the east soon after sunset, look for Luna on the rise and eye-catching Jupiter to her right. They are further apart tonight. What color is Luna as she rises? 10/23 Map/Text She sets in the west Sunday morning,10/24, at 9:00am. October 24-26, Sunday-Tuesday, the waning Gibbous Moon transits Taurus the Bull and readies us to manifest anew with an enlightened mind and spiritual aspiration. Luna first lies near the blue-white Pleiades star cluster, rising in the east Sunday night around 7:00pm and setting in the west Monday morning at 10:00am. 10/24 Map/Text She then lies between the mini-dipper-shaped Pleiades and the red star of enlightenment, Aldebaran, rising in the east Monday night at 8:00pm and setting in the west Tuesday morning at 11:00am. 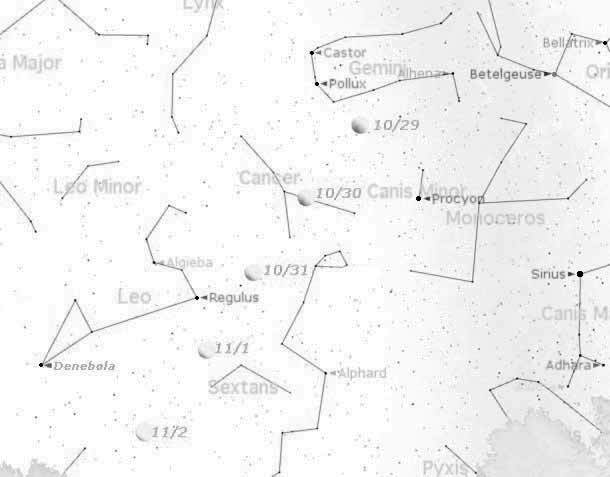 10/25 Map/Text Review map above to see the constellation Taurus in the east. Note: Bright moonlight interferes with the observation of the Pleiades; binoculars are helpful in seeing the cluster. BTW: Be sure to look for Luna in the western day sky before she sets. It is said that the Light of God, Buddhi, universal mind sweeps into manifestation in our solar system via the Pleiades, also known as the Seven Sisters. See Path to Sirius. The Pleiades seed the vision of Aldebaran, which in turn holds a divine ideal that can aid humanity's evolutionary process through its political systems, its nations. Imagine illuminating light descending on Earth flooding the governing bodies of our world. Bathe in heaven's light, if you ever have a fright. Waning Luna lies near Elnath next, the northern horn tip of the cosmic Bull. She rises Tuesday night at 9:00pm and sets in the western day sky, Wednesday morning at 12:00 noon. 10/26 Map/Text Review map above to see Elnath in the constellation Taurus in the east. Look for Luna in the day sky before she sets! Elnath is characteristic of perseverance and breakthroughs. When we look at Elnath we are looking toward intergalactic space, away from the crowded hub of the Milky Way Galaxy, beyond the limits of our solar system. Call upon this star for guidance in reaching new horizons. Ideally the waning Gibbous Moon is a time that readies us to manifest anew. It brings illumination to the influences of the entire lunar cycle. If not, dis-ease results. The constellation of the Gemini Twins lies upon the ecliptic and the feet of the Twins stand upon the galactic equator. Where the two realms meet (galactic and solar) we have the Gate of Man, the point at which spirit is said to enter matter (5º sidereal Gemini in tropical Cancer). Helpful Image Thus, the Twins represent spirit expressing soul purpose in everyday activities. Call upon the Twins to manifest anew, with divine vision and right earthly timing. The Last Quarter Moon can bring a crisis in consciousness as the Moon squares the Sun. This cycle's experiences have culminated and one must now prepare for rebirth by initiating change. This lunar phase is exact October 30 at 5:46am PDT (12:46 UT). Cancer reminds us that life is beyond the form experience. We are of the spirit and belong to its everlasting life. Cancer urges us to reorient ourselves toward this life, to aim the arrow of the mind away from the astral currents of the mass consciousness toward the intuition. Cancer encourages us to listen to and trust our inner compass and guidance, to sense right direction and initiate the changes that nourish the spirit and soul. The emanations of Cancer help us build a lighted house wherein Life dwells. The Beehive reminds us we are not alone. We are part of a group soul, humanity emerging from darkness into the Light. Initiate changes with the above in mind. October 31, Sunday, is "All Hallowed's Eve" or Hallow'e'en, when morning Luna lies to the west of blue-white Regulus the heart star of Leo the Lion. Review map above. Moonrise: 1:15am Regulus rises at 2:00am. The Seven Sisters reign over the hallowed Days of the Dead. November 1-2, Monday-Tuesday, is All-Hallowsmas, the name given around the end of the first millennium to All Saints Day, and All Souls Day respectively. Morning Luna first lies to the east of the cosmic Lion's heart star and then south of the Lion's tail star, Denebola. Review map above. Moonrises: 2:30am, 3:30am Regulus rises around 2:00am and Denebola 3:30am. Luna reminds us to celebrate the Spirit in and out of form during these Days of the Dead. This reminder clarifies our values and helps us surrender to a new future when the winds of change blow. Leo roars with the Hallow Moon during the hallowed days. Leo the Lion demands we follow the Higher Law of Spirit here on Earth, that we become the soul. His tail star, Denebola, whips into action with nearby Luna! If the Higher Law is not followed, Denebola, also known as the Changer, may bring about swift judgment when it joins with Luna. Be aware! Will you see Mars and Mercury hugging the sunset horizon? Navigate the Celestial Sea where Jupiter and Mira reside. A Witch Appears in the Heavens! Virgo the Virgin and her two planetary visitors are awakening the higher power of spirit within humanity. The winds of change are blowing. Our essential divinity with it's divine vision and right timing helps us see and tune to the signs all around us, so that we may align with divine will and prepare for the future and our rebirth. Imagine the spark of divine life igniting within each and every one of us. November 5, Friday, a New Moon occurs at 9:52pm PDT (04:52 UT 11/6). Stay tuned for the next edition of Moon Dances.